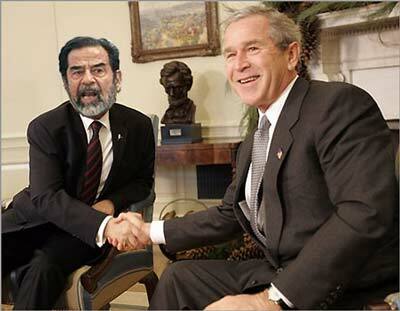 So they have carried out the execution of Saddam Hussein. I’m not a supporter of capital punishment but I can’t say I feel any sympathy for a man like him. However, it’s easy to point the finger at him as though he were some kind of lone serial killer. 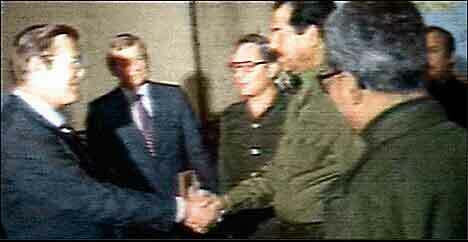 MSN News has a series of retrospective photos of Saddam with people like Yasser Arafat, Leonid Brezhnev and Fidel Castro. Let’s not forget, however, that he was also supported by France, the United Kingdom and the United States of America. Those countries, as well as the Soviet Union,Â are spattered with the blood of Saddam’s victims because they handed him the weapons then stood by and watched as he carried out his butchery. I have created a new page called “Climate” to draw attention to global warming. There’s nothing I can say about it that isn’t perfectly expressed in Al Gore’s film, An Inconvenient Truth. If you haven’t watched it, do so now. Is there such a thing as the average genius? Things have been quiet here on my ballog, but I certainly haven’t been. For the past few weeks I’ve been focusing on a children’s novel, which is why I haven’t been so active here. I’m about a third of the way through it and I hope to finish it by the end of January. I won’t be posting it here, however, as when the time comes to make it available on-line, I don’t want the nine-to-twelve-year-olds reading the other stuff I have here! The new novel will appear on its own website and anyone who is interested can ask me for the URL. I was training in the park this morning and something strange happened… Cecil the Accountant didn’t show up at his usual time. I didn’t think much of it at first. Perhaps he had had a particularly late night with the twins, celebrating his latest motor-cycling victory down the back streets of Shrewsbury. While I was waiting for him to walk past, I noticed a dog with a flashing red light on its collar. Novel, but not particularly strange. A short while later, another dog went past with a flashing light on the collar. Then another and another. I turned to Rob, my student, and asked him if he had noticed any dogs with flashing collars before today. He said he hadn’t either. What was going on? Was someone selling flashing red lights at the park gates at seven in the morning? It was so unlikely as to be inconceivable. It seemed much more likely to me that aliens were taking over the dogs of Shrewsbury. No, I was being silly. Or so I thought until I saw Mrs. Brady’s two dogs… with someone else! Something was amiss. First Cecil is late, then the dogs all start wearing strange collars, then the Schnauzers show up without Mrs. Brady. The only thing that seemed normal was Paperboy. He cycled past at his usual time, providing me with a moment of comfort in the increasing insanity. A little while later, Mrs. Brady walked past, sans chiens. I turned to Rob again. I asked if it was my imagination… Wasn’t she usually accompanied by those two dogs? He agreed that she was. Things were getting too strange now. Then a labrador walked past with no flashing red light on its collar. This dog could be trusted. No alien stooge he! But wait… What if the flashing collars were a decoy, a feint, if you will? What if the purpose of the flashing ones was to make us trust only the dogs with the normal collars? Maybe the labrador was a Trojan dog… although I didn’t really see twelve Greeks fitting inside. Now I didn’t know which dogs to trust. The alien plan was fiendishly clever. Soon we would all be in such a state of confusion that we would be defenceless against them when they finally came. I thought back over the morning’s chaos. The only really normal thing was Paperboy. He cycled by at his usual time. Then it hit me… He was behind it all! All newspaper magnates are secretly trying to take over the world. He is making his move and convincing us we were about to be invaded by aliens is just the first step. In a previous post, I talked about how the mainstream news agencies had ignored the news of a white, English BNP member who had been arrested on terrorism charges. This seems to me to be symptomatic of the fact that the news that’s fed to us is controlled by a handful of magnates. They decide what we read and what we see on the TV. So much of how we see the world is coloured by these people. They just decide how threatened we should feel and off they go. In the run-up to the invasion of Iraq, it was hard to find a point of view in the news that didn’t side with the Americans. I was one of those who was undecided about invading. It mattered to me because living in the UK, part of my tax money was, and is, funding that war. Of course, at the time, we were being assured by all and sundry that Saddam Hussein was forty-five minutes away from launching his huge arsenal of WMD. Impartial news is so important and so rare. I don’t want to read the news as half a dozen old men decide I should read it. That’s why I now read Wikinews first. Wikinews is written collaboratively by ordinary people, just as the articles in Wikipedia are. However, it’s not just a chance for pranksters to make up the news. Each statement of fact has to be cited and vetted. Wikinews has policies and guidelines, a style guide and a code of ethics. One of the best aspects is that if someone gets their facts wrong, they can be challenged, the point can be debated and the article corrected. What’s more, anyone can contribute to an article. The very best part is that it’s maintained by volunteers, not by some old billionaire living in a tower who wants to impose his world view on us all.